It’s the final month of the year! Can you believe it? 2018 is coming to a close in a month and, 2019 is just around the corner! I, for one, am astounded that this year is nearly complete. The holidays are now in full swing, with Thanksgiving already in the past. 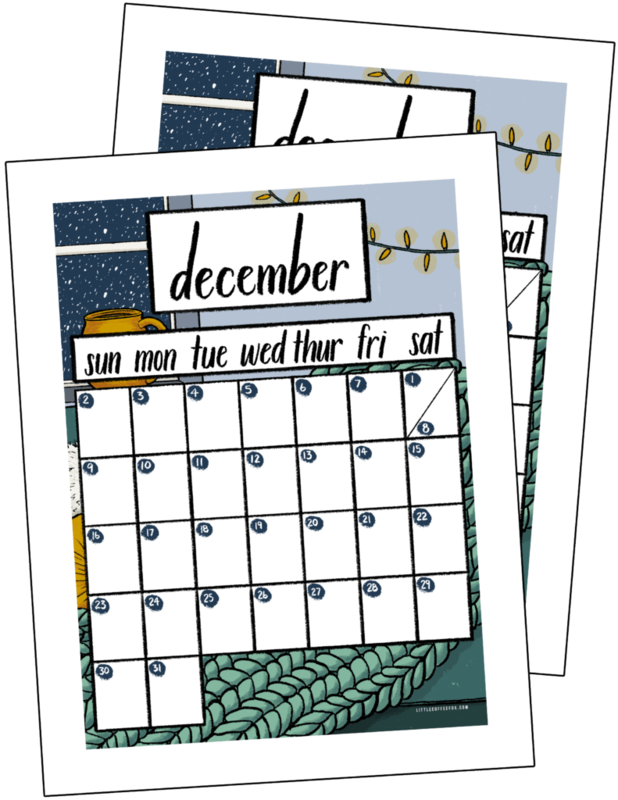 Speaking of Thanksgiving, the hecticness of the holiday week is the reason why this December 2018 calendar printable is a bit late. Blame the turkey! Regardless, let us soak in the cozy vibes of this December and enjoy the last month of 2018, shall we? As always, I created several different versions of this printable so you can make sure to get the one that suits you perfectly. Of course, there is the full color design, which I lovingly designed with a specific color palette. But if you prefer to have a black and white version so you can color to your heart’s content, then be my guest! December often has a strong feel to each person, and you may want to add your holiday-themed color scheme to your printable. I created these printables in the standard letter size (8.5″ x 11″) for my binder-toting peeps out there. But I didn’t forget about my A5 champs, either! Grab either the color or colorless version in A5 (5.8″ x 8.3″) so you can stick it in your bullet journal. And last but not least, I made a version of this December 2018 printable just for digital planning pros. If you have an existing planner template like I do and you want to paste the printable straight into that template, then grab the JPEG version that I created just for you! 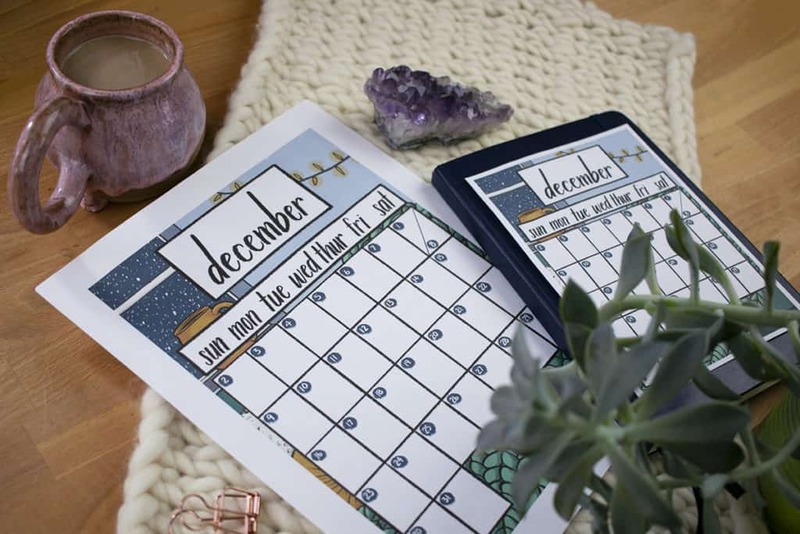 The JPEG will lay on top of the planner and not add a new page the way a PDF would — though if you want the calendar to be its own independent page (or you don’t have a planner template), then grab whichever PDF you like best and use it in your digital planner. Whether you choose JPEG or PDF for your digital planner, you can write and erase on the calendar no problem. If you like having printables created for you and ready for each month, then consider grabbing my 2019 New Year Printable Planner! I know that it can be hard to sit down and make time to create regular planning pages, especially if you’re inclined to decorate them and get creative. That’s why I make these free printables in the first place — to help you get a jump on your planning without having to stress about it. I created my 2019 Planner with that in mind. This planner is a perfect blend of beauty and functionality so you don’t have to compromise one for the other. This planner has over 80 pages, each one hand drawn and hand lettered by yours truly. There are beautiful monthly calendars, monthly trackers and logs, weekly layouts, new year worksheets, and more. You may be wondering — why buy the full planner when you get the free printables each month? You won’t have to worry about me publishing new printables late (like this month). Everything you need has already been created and it’s all ready for you when you purchase. The 2019 Planner is all designed with a similar theme. Each month in the planner is different from the last, of course, but there is a cohesive feel throughout the whole year. These freebies, on the other hand, are subject to change wildly month to month. If you want all of your printables to fit together nicely, then the 2019 Planner is for you! You get so much more in the 2019 New Year Printable Planner! With over 80 pages, you have a ton of resources to help you reach your goals in 2019. These freebies, on the other hand, will only give you twelve pages in 2019, give or take. Check out my 2019 Printable Planner and be ready for the new year! The 2019 New Year Printable Planner is an excellent option to help you get prepared for the new year. If you don’t feel like you have the money to spare for it or the planner ain’t your jam, then that’s fine! I make these monthly free printable calendars for you to use, and I won’t stop making them any time soon. Either way, I’ll be here to help you keep planning and organizing so you can make progress toward your goals. Ready to download your free printable? It’s easy to get access to it! Just sign up for the Fox Den Resource Library for free and the December printable (along with the rest of the library of free goodies) is all yours! Click here to sign up if you aren’t already and get your printable now. Get access to tons of FREE printables and worksheets All you need to do to get access to this monthly header printable and much more is click the button and sign up for the Fox Den Resource Library! If you're already a member of the Fox Den, just click the image below and use the password to log in to get access to the printable. If you are already a member of the Fox Den, then you’re all set! Just head here or click the image below to get to the sign in page. 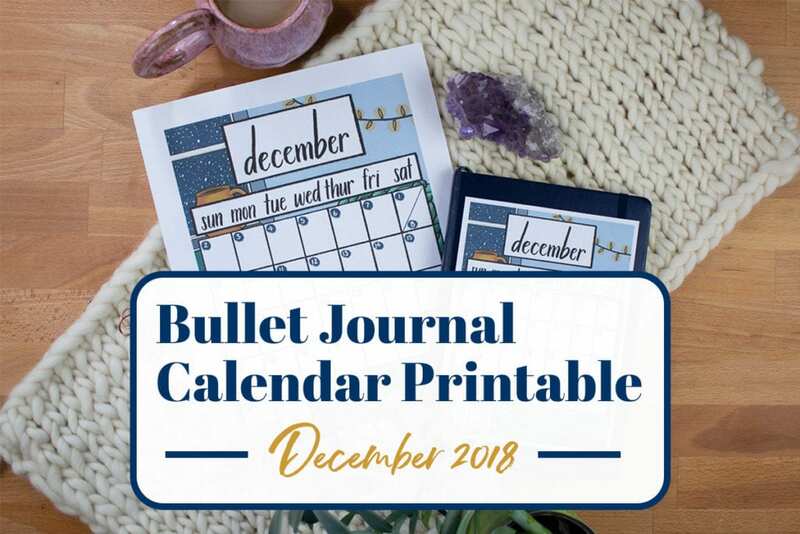 Enter the password that was sent to your email when you signed up and you can download your December bullet journal printable! I hope you enjoy your December with good friends, good food, and a warm blanket.